Michael Johnston lives in Sydney and works in the finance industry. 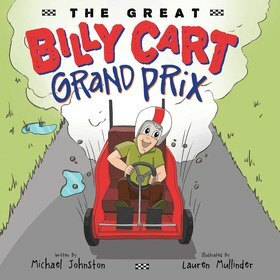 The Great Billy Cart Grand Prix was inspired by the billy cart races that were held every year at the school he attended in Brisbane, where he grew up. The book is loosely based on the true story of his two friends, Tom and David. The three of them are still close mates today. The adventures of the author’s childhood evolved into a bedtime story one evening, which was shared with Tom’s kids, Ellie and Fred. The other children in the book are based on Michael’s nieces and nephews. When he is not working in finance or writing kids’ books, Michael enjoys cooking, traveling, spending time with his friends and family, and is currently studying his MBA at the University of New South Wales.